Let’s get this straight, Billy Williams is a champion. You think so the minute you meet him. Triple South Melbourne best and fairest, Bloods Team of the Century member, Australian Rules Hall of Fame. The only surviving Swan from the Bloodbath Grand Final. A ripper jag of titles, but there’s something more to it that that, which, on arrival, I can’t put my finger on. His son, Rod greets me at the door, about 60 to look at him, solid, full of energy and enthusiasm. We’re at Billy’s apartment in Willy, not three kms from where he grew up, in the then rough industrial town of Newport. Once a Westie, always a Westie. “Hello, Matt. Thanks for coming,” Billy says, putting his hand out, before I meet his wife, Maureen. The bloke is about 90 and looks it. No way am I going to introduce myself as Old Dog! He’s a small man, no different than any other aged fella, other than they way he looks right into you. “Right, let’s get to it!” Rod claps, super enthusiastic. “You want to start with the photos?” Rod confirms with him. We walk up the stairs to look at what’s on the wall. Billy points out so many of the greats he had the pleasure to play alongside – at South, in the nine games he represented his State with. Never himself though. “Coleman… Alan Ruthven, Ron Clegg, Laurie Nash, Bernie Matthews, so many of them were good,” he says, but struggles to relive some of the memories. Rod shows me the front row of the Victorian rep team. I walk through the small corridor, surrounded by so many highlights, images from a forgotten world, another era. Of mud and blood and concussions behind play and ankle-length boots, one-on-one footy and no on-the-full for backmen. For me, the photo that lingers is of Billy, young, with the long sleeves, hamming it up, shaking the hand of some big donk recruit who followed him from South to the VFA. Billy looks so small, so happy. He’s half the size of the recruit, surrounded by snaps of other, grander moments and bigger name players, yet his smile dominates the wall. Of all the photos he stares at this one the most, too. Just stands and watches it, without mumbling a word. Soon enough we go downstairs, everybody sitting at the dining table. Billy flanked by Maureen and Rod. I ask him about the Bloodbath, held in the aftermath of WW2, at Princes Park, when the American soldiers had reign over the MCG. I tried to get some backstory on it, but could find very little other than there was biffo everywhere, on and off the oval, hard rain, king-hits and kicking, police and trainers running onto the field to break up the violence. Not many details. According to George Gaetner, (a 17 year old who faked his I.D. and snuck into the press box) the media were supplied with two full kegs of beer rather than tea, and too drunk to make out the oval. I sit in Billy William’s neat, warming home, waiting for him to spill knuckles and guts and knee-deep mud all over the table. To tell me about the game that survived by word of mouth, that has been passed down as folk law and will forever be legend. “I don’t remember it,” he says, like fact. At first I think Billy’s being honest, that his memory’s gone. “Chitty knocked me out…” he tells me. Whenever he pauses too long he turns to his son. Rod has heard all the stories before, and tries his hardest to nail them word perfect. He finishes the sentence, with the smallest nod from Billy, or, more so, a hardening of his jaw, confirming it. “An elbow to the head,” adds the younger man. “That’s what started it all,” Billy finishes. And wife and son wait to see if Billy can, ready to pick him up if his voice falls silent. I look at the scores, and sure enough, Carlton pulled away in the second half to win easy. Billy often looks frustrated with his memory, even apologises occasionally. “I’m sorry, I can’t remember. You waited too long,” he tells me. It chokes him up that, often, no words will come out. But his jaw remains firm. His eyes steady. Bloodbath out if the way, we take it back to the beginning. To a life of hard work, loyalty and determination. Billy was south of the city through-and-through. His father steered the old punt across the Yarra, joining industrial west and the city, for 42 years. “He had to have an sea captain’s licence, as he was crossing international shipping lanes, but the punt did him,” he tells me. I ask why, and get an impression from the answers it was because of religion, but it seems nothing would stop Billy. Not if he loved it. “I was a fitter and turner,” he tells me, in that frail voice of his. “While doing my apprenticeship I would ride from Newport to Sunshine for work, and play footy. It was a long way, on roads different to today, but no-one had cars back then. I was always either in the factory, or riding to it, or a game,” he grins. I ask about his playing days. “I had a run around with Carlton, but didn’t like it. They went against new boys. South were exciting. To run out as a kid with Herbie Mathews, Laurie Nash, Bob Pratt was amazing,” Billy tells me, then pauses. Talking seems hard, remembering seems harder. I really feel for him. Maureen puts a brave face on it but I suspect she’s hurting. “Who was the coach back then, Billy?” I ask. He has trouble understanding my words sometimes, yet his son just has to say the exact same words, and Billy captures every one of them, easy. Billy spent his first year in the forward pocket, then moved up onto the ball. Along the way he met Maureen. “A Kensington girl,” he adds, with cheek and pride. Westie talk for ‘not quite local’. “Though football,” Maureen adds, with the best smile ever. I saw photos of them when I was walking up the stairs. So young, handsome and beautiful. So invincible. Not that it was easy, both families were very religious. “I was Catholic, and Bill wasn’t,” Maureen says, with sadness. A huge thing in those days, especially in such religious families, yet Maureen seems as determined a person as Billy. I ask about the conditions back then, how they went about it under Bull? Billy tells me of his first year, in ’45, as a 19year old. The Bloodbath year. “So you cost South the Premiership?” I roar. Billy laughs loud, a corker laugh. He still has his humour. They all laugh, like one. It’s magic. And he laughs again, even better. “He was a hero on that day,” Maureen croons, in a soft voice, head tilting back to touch Billy’s shoulder, full of immediate affection. The sort that seems like just yesterday, forever. After three years in a Newport factory Billy brought a fish and chip shop in Port Melbourne. A rough place, solidly behind the Bloodstained Angels, so Billy put a photo of himself playing in the window. I ask about how wild the old sea towns were? “Port Melbourne was always tough, but like anything, it depends on what you do, and how you get along,” he tells me. All up, Billy played just seven years for South, but that was standard back then. Billy very much enjoyed his short time at Williamstown, coaching local. It felt right. Then, there was more hard work and heartache. Maureen was in hospital for three months with rheumatic fever. So Billy went looking for another coaching job, away from the industrial west of Melbourne, from the area he loved and grew up and played all his footy in. “We moved to Pyramid Hill, which only had a population of 600, but was just marvellous. Terrific people. The best,” Billy says. “I did thirty years in hotels after that,” Billy gives a frail grin. “All through football,” Maureen adds, for the second time. The family tell great stories, about Jack Dyer, Laurie Nash, the Glenferrie oval, the way Lou Richards would chat up the umpires to get away with hitting you, the joys of playing at the Lake, even memories of the great Bobby Skilton. After a while I can’t tell who starts the sentences and who finishes them. I get the idea Billy worships the memory of Jack ‘Basher’ Williams. South’s enforcer of the 40s. When Chitty took out Billy with an elbow, it was Basher who evened-up. “A lot of them were like that, though. Fine people off the oval. Basher was a thorough gentleman. All the players would swear like sailors, but if any of them used a cuss word in from of women, ohh, he’d challenge them! Billy smiles a great old-time smile. I bet he was a ratbag back in the day. Suddenly, I’m gutted I didn’t know him then, that I couldn’t see it. The heavy-set knuckle and the little rover. We talk about the Swans flag in 2005, their fist in 72 years. “So this time you won them a flag!” I roar, and there’s that ripper laugh again. “They’ve won us for life. The Swans have continued to treat our family, their history, so well. For life,” Rod insists. “Tell me about the game…” I ask. And she excuses herself from the room for a few minutes. It’s enough to make you believe in a club. Have faith. Respecting their past without living in it – that balance took years to get right. When they did they won a flag. No, it wasn’t just a co-incidence, these things count. They help so much in small, unmeasurable ways. It’s pretty obvious that the Billy Williams story includes his family. I ask Rod about his playing days. He’s painfully modest, acknowledging he only got to play a handful of games, and, even then, only because they wanted to see if he had any of his father in him. “Well, there you go!” I say. “Only because he had to play an interstate carnival!” Rod laughs at himself. Like his father, like his father’s father, Rod stayed true to his roots, returning to be a part of the Williamstown FC committee for 16 years, before focusing on his children. When it comes time to say goodbye, a lifetime too soon, Rod tells Billy to stay inside, he’ll walk me to the car. Billy won’t have a bar of it. Determined. I wait, as he shuffles after me, locking eyes and saying in that whispering voice of his, what a privilege it was to have me around. He shakes my hand with the mightiest, firmest grip, despite his frail body. In its moment, in his stare, everything about him is still. For its length I can feel his fierce pride. The furthest corner of his mouth flickers that smile that once ruled the world. I turn as I leave, noticing all three watching me. I never knew Billy Williams back in the day, but can only greet people how they greet me. I think, now and forever, the Bloodstained Angels legend is a champion, because he has a champion family. With love, with admiration, they speak as one. A team, used to hard yards, caring, always determined. No wonder he’s still kicking. Matty, an excellent summing up of the Williams family. 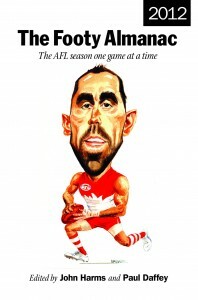 Billy is an unsung hero – he was selected in the Swans Team of the Century. Billy was once the publican of the Morning Star Hotel in Williamstown. of the Stawell Gift in 1956. Excellent work Matt. These sorts of insights show how footy matters at times, but also how it doesn’t ultimately matter. What sticks in the minds of the old blokes is their mates, not the final scores. Great Zurbs. Read ‘The Bloodbath’ by Ian Shaw. “Fessed up to him at the Swans Team of the Century dinner. He had a laugh. His son, Rodney, had a few games for Rochy in the Bendigo League, but it was better for business that he ran around for the Bloods in the Heathcote league. Great story Matt , this really gives you a feel of the real bloods culture and what it is all about History. 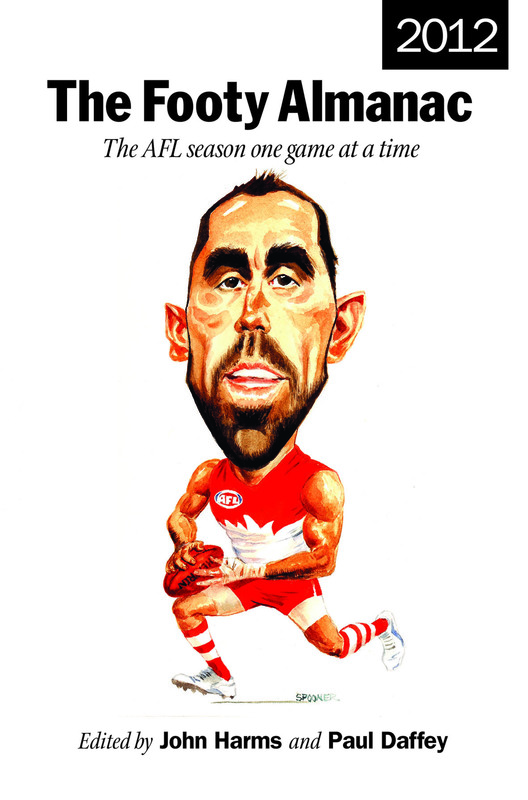 Loved this piece Matt – Billy is a gem of a bloke. Great values. His father was a great supporter of Rodney. Touching, poignant piece. Thanks Matt. Gave me goosebumps reading it. The proud old man and the prouder family. Those names – Pratt, Nash, Clegg, Ruthven etc etc. One of the great lines “but the punt did him”, and for once we’re not talking horses and bookies. Great work Matt – capturing a first hand account of football (but not as we know it), before it’s too late. A fantastic insight into times gone by, very proud as a Swans fan to see how they treat their past legends.